First of All this message is concerning a Dog faced puffer fish Juvenile (Arothron nigropunctatus). I have scoured the Puffer-fish disease pages and used the key-word highlighter with as many variations as possible. Let me start at the beginning but as brief as possible. I started up a small 35L tropical tank in June 2009. My husband started up a Juwel80 110L Marine conversion a couple of weeks later. We jointly decided to invest in a custom made 450L marine set up with sand bed sump (originally a 60L but now the 110L). At the same time I acquired a 96L Juwel and a few months later shut down the 35L. In April we finally had perfect water conditions in the 450L and decided that it was time to start adding some corals. However as the Dogface wasn't satisfied with just eating the excessively large and varied diet we supplied him with, the corals became an expensive meal, even the decorative Algae became prey to the duo dog'n'fox. I could save enough for a new larger system to house them sufficiently. They moved in there mid-July along with our fuzzy dwarf lion and white striped maroon (Premnas biaculeatus). and 'Doggy' came out of his sulk. However the humbugs didn't like the domino's and killed off two of them until I was left with just the two humbugs and one docile domino. I also acquired an Aiptasia eating filefish (Acreichthys tomentosus) out of the coral tank who had also taken a liking to the corals. The tank remained stable until 8 weeks ago when I couldn't resist buying a beautiful, baby, trigger fish (Odonus niger). and work out what is wrong with 'Doggy' for two weeks. Although a couple of water changes bought the PH up, it still remains low at 7.8. I have added Seachem reef carbonate, which bought the KH up to between 10 and 12 temporarily. I tested the magnesium which was 1020 and have added Seachem reef magnesium which bought that up to a more adequate level. The calcium has remained stable. As I was getting so frustrated I opted to try Seachem reef buffer that bought up the PH to 8.2 on Friday evening but then dropped back to 7.8 by Saturday. I also decided to start treating 'Doggy' with Melafix. A half bag of activated carbon, ceramic hoops and Polyfilter. The U3 housed Sponges, carbon sheet and Seachem Denitrate. I now have just the Juwel with half bag of ceramic hoops, bag of Denitrate and topped with filter wool (The activated carbon was removed for Melafix treatment). I noticed that despite my best efforts 'Doggy' has begun to decline. Something freaked him on Friday -- He puffed up to 5 times his size. Since then he has lost interest in his food, is hiding more and has developed Ich on his fins and eyes. The domino has also gone dull and the Maroon and Trig seem to have cloudy eyes. The filefish seems to be the only healthy fish. but I'd like to avoid using copper with 'Doggy' and his sores. I don't want to upset or stress any of the fish further by moving to quarantine. I feel like I'm running out of options and am in danger of the system crashing and causing a wipeout. I really don't want to loose my fish, especially 'Doggy' and 'Trig'. Please help!! FYI -- the spotty appearance shown/discussed re. 'Chomper', http://www.wetwebmedia.com/puffdisfaq3.htm?h=chomper in the puffer disease pages seems to be the stretching of the pores of the skin during the inflation and deflation of a scared puffer (I noticed this when 'Doggy' freaked on Friday) -- I hope this info can help other puffer enthusiasts and that my PH problem will warn others not to change their water source or salt and cause the problems I've experienced. Always use a decent reef salt which contains the natural minerals and buffers. Photos attached are of Doggy, the sores on his head, and lumpy skin on his belly (this is all over his skin). Many Thanks for such a great site, and for any suggestions you can give me that can help me battle to save 'Doggy'. Sorry for the length of this email ( 2 pages in word) , but I have tried to keep it to just relevant information while observing the contact rules -- spellchecked and read twice -- Main points in bold. P.S. Upgrade ideas welcomed. E.g. AquaMarine900/Maris filter. I've got big fish that need a big home. Hi again. Thanks ever so much for your speedy reply. Certainly noted re. Copper a Mela-not-fix. I will continue with the water changes and should be able to purchase their new tank by the end of November. Just to let you know that although these are considered large fish, they are all juveniles and not fully grown so the 96L actually seems quite empty. I have reduced the feed amounts so as to reduce the pollutants and forgot to mention that I have been adding Lipo-vit to the frozen food diet. I also feed Nori a couple of times a week. I will be registering on the BBforum so that I can ask opinions on an adequate system for the upgrade (As I'm sure you're busy answering emergency emails). I don't know exactly what I did right last night but the 5 fish are generally looking much brighter this afternoon, especially 'Trig' whom is free of cloudy eye. 'Doggy' was in his favourite corner squirting for food and nibbled happily at the Nori I offered (hand feeding is so satisfying). As regarding the see squirts - do not bring anything home from the beach!! - Whether this was the start or not - the hubby collected some snails (naughty boy) a week or so later we had an outbreak of sea squirts. Small amount not a problem - but they took over the rock - depleting the food supply that our rock dwellers need to survive. Just to clarify - I sent this picture for amusement purposes. Dog'n'Fox. This duo had an incredible symbiotic relationship where they would not leave each others sides. Sleeping together, Eating together and sharing food to the point where Fox would try to blow the sand and mimic the dogface. that finally annoyed the Dogface to the point of becoming a meal. I bought an Arothron 2 weeks ago and it is very very sick now! I have a fish, probably an Arothron mappa, who is very very sick. It started when temperature lowered to 71.6 Celsius. his teeth all the time, I have been told his teeth could have overgrown and the stress could have caused the Ich) and one of his eyes his like whitish. He has been constipated, then diarrhea (sorry). We put a shrimp to eat the Ich off him but either it didn't happen, or it didn't help. We are really concerned as he looks ultra weird now!! Temperature raised to 82.5. UV filter installed. Thank you so much, I cannot find any vet to help! Please help. I am trying to treat my daughter's dog face puffer for what I believe to be velvet Ich. (and a few snails, hermit crabs. days because I noticed he seemed to be dominating the tank and forcing the puffer into a small area. A not very happy puffer. After I removed the trigger, the puffers color seemed off, mottled looking. He did not seem otherwise ill. After 4 days he stopped eating, stayed mostly in the rock and exhibited occasional scratching. He also developed a slightly gold color on areas. I checked the LFS and they recommended adding VitaChem to boost immunity and he should recover. in the large tang, I removed him to a QT on Sat after carefully matching the salinity, temp and pH in the new tank. I did a 5min fresh water dip and a 10sec Methylene blue rinse before putting him in the new salt water. He seemed very active after the move, mostly, I think he was angry about going from a 6ft run to 2ft. Shortly after moving him in noted thread like strings in the water. He appears to be shedding a slime coat. What do I need to do to protect him from secondary infections or dehydration, assuming that most of the Ich has been dealt with? I currently have a UV sterilizer attached to the system, a protein skimmer, biofilter and have added VitaChem and Stress coat plus. cautiously optimistic. Any suggestions would be welcome. water changes, VitaChem and UV filtering in QT continue. I think he out of immediate danger from the Ich, but he still has no interest in eating. He has not eaten for 12 days. Is there anything I can do to get him to eat? I have a 150 gal. 5 week new set up. Cycled with 15 pounds live rock, few damsels, and crushed coral substrate. LFS checked water and OK'ed for fish. 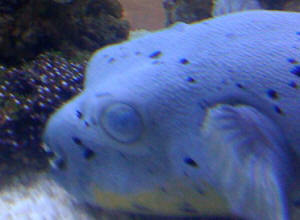 A large Blue Dogface Puffer, had been on hold for us for 5 weeks. They said all fish have to go in at same time since he's territorial. (big mistake). in went med. Lunar Wrasse, lg. Majestic Butterfly and lg. Garibaldi. med. Greenbird Wrasse, small Goby, Blenny, Black and white clown and med. Purple Tang. Two days later added corals and two anemones. Then all went downhill. White salty looking crystals on tang, butterfly, garibaldi and wrasse, but all were eating. The Puffer seemed ok still eating but was squinting his eyes. I thought the anemones may have stung his eyes. I did nothing that day (I didn't know it was a bad problem). 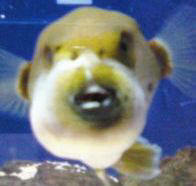 Next day everything was worse and now the Puffer's eyes had a white coating on them making it difficult for him to see. He stopped eating that day. LFS said it was Ick add CU. I did, but next morning Garibaldi and Greenbird Wrasse were dead. and increasing temp. Next AM the butterfly was dead and Lunar Wrasse died next AM. I then came across literature that read Puffers are to sensitive to CU. and moved him to a 40 gal hospital tank with external aqua clear filter. Added penicillin and Bifuran plus (Nitrofurazone and Furazolidone). At first I thought his eye problem was from the ?Ick. But two days in the copper water yielded no improvement. the puffer, (would visit him several times a week over the six weeks prior to getting him). I know it is my ignorance that has caused all of this. We are desperate to heal the Puffer and prevent any further suffering. What is on his eyes, I cant find any info. and have been searching for days non-stop. Picture attached is from day 1 of white eyes. They are much worse now. Thank you. I have been reading the puffer crypt link you suggested. However I find a lot of conflicting advice. Yesterday moved the puffer to the 40 gal QT with the previously mentioned meds. that you questioned. I am doing a water change today on the QT and main tank with the smaller fishes (who by the way seem fine). The puffers eyes are the same (thick white plaques). He still cant see. CU and Formalin are to toxic for him, Quinine may not even be a proven cure. Today he has a slightly mucusy stringy film coming off his skin. I am continuing to read to seek a correct cure. But am still confused as to what to medicate him with in the QT or should I give him FW baths or FW baths with meds. bacterial infection and the Bifuran in case it was secondary fungal. Since it is on his eyes I cannot get a sample of it to view under microscope or test in micro. lab. at local college. I hope you are all having a great day. I myself am having a few problems and am in need of some assistance. I have a juvenile Mappa Puffer who is about one inch in size. When I first got her she did really well. I put her in a 10 gallon QT and she began eating quickly there after. The next day I noticed she wasn't doing so well so I checked my water and the ammonia was really high at about 1. This surprised me a great deal as I used the water from my 55 gallon tank to set it up and the ammonia in that tank tested unmeasurable. So I started trying to figure out why/how it got in there and I believe it was from me not cleaning my hands well. I have ordered some aqua gloves but did have another question about ammonia. Is it possible for cigarette smoke to cause ammonia to rise in an aquarium? My husband is a heavy smoker and works in the same room with the tank smoking all day and I was wondering if that could be adding to it? I have some clean PVC corrugated sheeting which I was planning on using to make a cover for the tanks to help stop the smoke from entering the tank and yet leave room for some air flow. But wanted to ask you if Metal Halides would melt the PVC sheeting. Also another situation that's come up is the Mappa Puffer has Ick which I noticed at the same time I tested the ammonia so I gave her a fresh water dip but after 30 seconds to 1 min she didn't look like she was doing well. She flopped out of the water (almost out of the container I was using) and puffer up, then sank to the bottom and her breathing slowed a great deal. It actually looked like she was about to die. So I took her out and put her in clean salt water where she has been ever since. My question is... which method should I use to treat the Ick at this point? Copper? Something else? Should I try using hypo salinity? I have read over your FAQs and know that you all kind of frown upon low salinity and I'm not sure if she can take the copper or other meds. Should I continue to try fresh water dips? She is eating (mostly she likes the New Life Spectrum flakes I use) but she will nibble at the Selcon soaked shrimp and then snub it. I have tried giving her squid which has the same effect as the shrimp and she won't touch any of the fish I have though that's not really a surprise. She also tried to nibble at a few of the snails in there... though they are almost bigger than her... its kind of funny to see. As long as I give her hard foods like clams and other hard shelled foods in between is it ok that she mostly eats the NLS flakes? I had read on your FAQs somewhere that Bob feed almost exclusively NLS foods to his fish so I am hoping this wont be a problem. I went looking for a quinine med but the only one I was able to locate was Tetra Pond which is for well... ponds. Its active ingredients are formaldehyde and quinine hydrochloride and it says 10 ml per 50 gallons is the dose. So my question is though its for ponds is it ok that I use this for my fish (Mappa Puffer)? Other fish which are most likely infected though in different tanks are Blue Tang, True Perc, Yellow Tail Damsel, Raccoon B/F. Can all of these fish be treated with this? If not which one would you suggest? The water seems fine and I do 30% - 50% weekly water changes just to ensure things stay okay as he creates a large bio-load and he's currently in my 55 gallon tank until the larger one cycles. If you have any idea please let me know! By the way, he's 13" long so a freshwater dip would be extremely hard as he's not a fan of being netted. Yes, I just bought a Map Puffer online the other day. He is about 4.5 inches long. When I put him in the tank everything seemed to go well, he swam around and looked very normal. He ate OK, by OK I mean he ate, not a lot, but he ate the 1st day in the tank that night. The next night when I went to feed him I noticed a lump on the underside of his belly. It is not an open sore. It looks like something is growing inside him. So far I have seen him scratch it one time and one time only during the whole time that I have been watching him. I looked at the lump this morning and it has grown bigger than it was last night. He still eats somewhat, not like the puffers that I have in my other tanks though. He does not seem sick any anyway. No signs of stress, he acts totally normal other than not eating like the other puffers I have. I cannot find anything online that refers to a LUMP. Can you maybe give me some advice on what this might be. I have never seen anything like this before. The tank has been cycled for over a month now. It is a 180 Gallon tank with 2 AquaC Remora pro skimmers and 2 Eheim PRO 3 filters. The AMM is 0 the Nitrites are 0 and the nitrates are barely readable. The ph and salinity are right on the mark. He has 4 other tank mates. 1 JUV dragon wrasse, 2 damsels left over from cycling, and 1 dwarf zebra lion. They are doing very well and eating like normal. Any information you can give me would be very helpful. Thank you very much for the thoughts and information, and getting back to me so fast. But to add to this story now the LUMP has gotten much larger and he does not eat at all. He is also not active at all. The LUMP now is very profound and it definitely looks like a big piece of cauliflower on his underside. Does this help at all? Yes he is in a Quarantine Tank. The water quality is very good, 0 AMM, 0 Nitrites, Barley readable Nitrates. PH and Salinity right where they should be. I purchased him online because they are so hard to find. It can't be that he has eaten to much because he hasn't ate at all now for 2 days. And like I said he has barely ate anything since I got him. I did call the reseller and he is also trying to find out what it might be, I am sure he wants to find a cure also rather giving me a refund or credit or replacing him. wet/dry filter, and protein skimmer. I do realize after doing research on your site that this size tank is too small for him and we are actually in the process of purchasing a 180 gallon. two days ago I noticed his eyes were getting hazy (read from your site that this is usually a water quality issue), but he was still eating. Today I noticed his eyes were the same but his jaw was rather swollen (like he was stung by a bee), and he is much darker in color than when we first got him. He is very lethargic and now is not eating. He just lays at the bottom of the tank. We just set up a quarantine tank ( has the same param.s as mentioned above) and because I'm afraid he will not make it I started antibiotics in the qt tank (tri-sulfa). So I guess my question is...Am I doing the right things? should I be doing more or less? Any help would be appreciated. Thank you very much...Daneen. and while that's a different species to Arothron nigropunctatus, I do believe that the genus is more or less euryhaline. So the slightly lower than optimal salinity by the standards of stenohaline fish might not be the issue here. that cloudy eyes often go along with missed water changes and the resulting background water quality problems. For what it's worth, when I rescued these Arothron hispidus they were very dark in colour and spent a lot of time sitting on the bottom, tails wrapped around their faces. No medication was necessary. Once moved to middling brackish water -- seemingly where baby Arothron hispidus are commonly found -- they pepped up extremely quickly. They seem to be extremely hardy and resilient fish. Admittedly, these two were in a 200 gallon tank with a big sump and a skimmer, and I agree wholeheartedly that 55 US gallons just isn't enough, whether in brackish or saltwater conditions. Before I forget, another issue might be the size of the puffer. Juveniles a couple of inches long are really quite easily bullied. If with a lionfish or moray say, might the puffer be swallowed, puff up, spat out safely, but ultimately traumatised? Anyway, enough for now. Enjoy the rest of your weekend. Really? You see Arothron spp. around the 5 cm/2 inch mark all the time here. The attached photo isn't quite that small, but the size of the fake Acropora gives you some idea of its small size. <This IS a small specimen! Don't see them this tiny even in the wild often. I wonder if the European suppliers are getting them as younger fish from estuaries, compared with the older saltwater specimens handled by American suppliers? Hence why they sometimes end up on the freshwater fish lists as well as the marine fish lists? 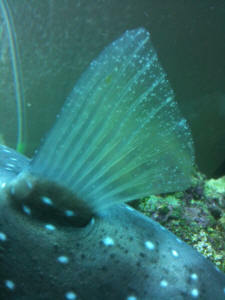 <Mike Maddox recently penned a great primer on Arothron pufferfish for Conscientious Aquarist, and I'd recommend having a read of that before you do anything else. , and was hoping you knew what was wrong with him and what should be done next. He is normally kept in a 40G acrylic tank, with a sump / wet dry filter. I do my water changes regularly, and my nitrates are below 20ppm and the pH is kept at 8.2. He is the only fish in the tank, other than a Clark's Clownfish. This one is the third one I've had that has cropped up with this disease now, and I've had him just over a month. On the other two puffers, the puffed up spot was in different places (one had it on his back, the other on his jaw like this one). The system was bought new, and I've never used copper or any other medications in the tank. He has just been going downhill since I noticed the disease. Please help me out!